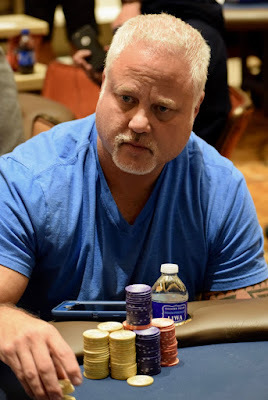 Down to 11BB, Glenn Larson gets his remaining stack in the middle preflop and Casey McCarrel moves over the top for about 2x more to put Larson at risk. The board runs out K-J-4-A-8 and Larson is eliminated in 7th place, a $25,304 cash. A few hands earlier, Larson lost a large chuck of his stack when he rivered two pair, but that card gave Dann Turner a straight.